I’m accustomed to seeing Charlotte Gainsbourg in all Balenciaga everything, but at the Nymphomaniac: Volume I Screening in NYC the French actress opted for a head-to-toe runway look from former Balenciaga designer Nicolas Ghesquière’s debut collection for Louis Vuitton. She wore a white blouse with a frill collar, yellow and black v-neck knit vest, black vinyl trousers, and tan patent leather ankle boots. In my opinion, Charlotte is the embodiment of chic, thus I loved this look! This was so effortlessly done: not sure anyone else could have worn it better. 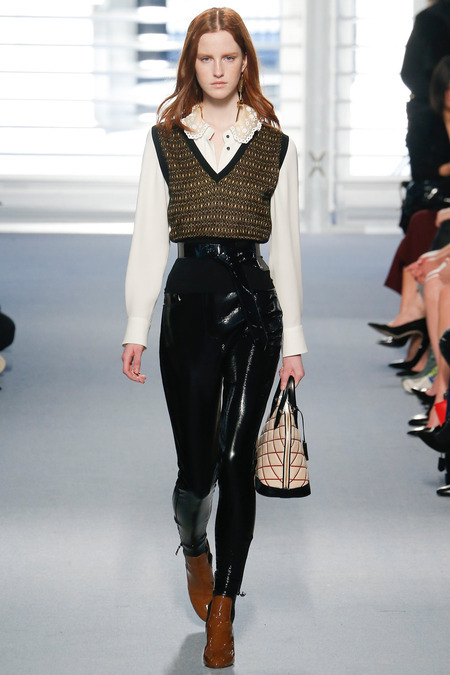 Visit www.louisvuitton.com for more information and see Charlotte’s look on the runway below, worn by Magdalena Jasek.